In 1979, when I assumed ownership of the Eastside newspaper chain founded in 1945 by Joseph Kovner, I was unaware Eastern Group Publications (EGP) would become a life-long passion to give voice to the stories of people and communities largely ignored by larger media outlets. Nor could I imagine the amount of hard work and investment it would take to rescue a newspaper group on the brink of bankruptcy and expand its reach throughout the Greater Eastside of Los Angeles. Over the course of the following four decades, we transformed EGP into an L.A. County institution that would serve the community as a mouthpiece and as a defender called upon time and time again to fight on behalf of those from our communities who had until then been voiceless, powerless, disenfranchised, marginalized, oppressed and exploited. We also made it a priority to report on the people and institutions positively contributing to the unique and vibrant culture in these same neighborhoods. The recent and unexpected passing of my husband and partner, Associate Publisher/COO Jonathan Sanchez, and my son, CEO/CFO Joseph Sanchez III, however, has led me to the decision that it is time to sell EGP’s six community newspapers — the Eastside Sun, Northeast Sun, Bell Gardens Sun, Commerce Comet, Montebello Comet and Vernon Sun. After much soul searching and debate, our family — Managing Editor Gloria Sanchez Alvarez, Advertising Director Bianca Sanchez Preciado, Office Manager Sarah Sanchez Ramos and Board Member Michael Sanchez — believe it’s time to pass the torch to new, more energetic owners willing to take on the task of shepherding this venerable media group into the next phase of its existence. When we started 39-years-ago, we were all—with the exception of Jonathan—newly minted publishing industry neophytes who learned as we went along. Our first issues were full of typos and mistakes. Our victories were the community’s victories, won through advocacy on behalf of those in the neighborhoods our publications served. It was and has remained our duty to investigate complaints shared with us by those who felt they had suffered as a result of government neglect or racial discrimination. We stood up readily in defense of those who had become victims of injustice with unflinching editorials and articles published concurrently in multiple EGP publications. More than once we found ourselves at odds with government officials or elected officeholders we did not hesitate to hold accountable when their actions or failure to act reflected poorly on the posts or stations they were hired, appointed or sworn to uphold. In addition to its unprecedented bilingual English and Spanish coverage of communities and municipalities stretching from Northeast Los Angeles through Boyle Heights and East L.A. as far as Montebello and including the cities of Commerce, Vernon and Bell Gardens, EGP actively lobbied at the city, county and state levels in support of smaller community publications. We felt and continue to feel that community-based publications and news media committed to sharing news and information as a public service, no matter how large or small, should be entitled to a fair share of the public funds earmarked for advertising. During the course of our decades-long drive to become one of the nation’s most highly regarded bilingual newspaper chains, we never lost sight of our sincere belief that “a free and independent press preserved the peoples’ right to know.” As editor-in-chief and publisher at the helm of a newspaper chain that currently reaches six distinct but contiguous communities with six corresponding weekly publications, I still marvel at the fact that our flagship newspaper, the Eastside Sun, has published continuously every week for 72 years. I love what we have accomplished in service to our readers and advertisers and fellow independent publishers who have likewise chosen to focus on underserved communities. 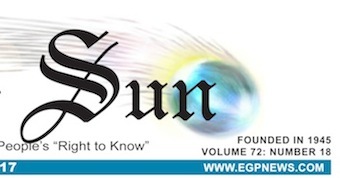 For the prospective investor, EGP’s print operations are complimented by a user-friendly online community news and information platform – www.EGPNews.com – that reflects the unique, bilingual community news coverage our popular print editions continue to provide for thousands of readers and households throughout the eastside of Los Angeles. For those who, by choice or necessity, are no longer able to call those communities home, www.egpnews.com provides the direct digital link to news and stories about the communities so many sons and daughters of those environs still hold dear. It’s hard not to be nostalgic as I recall how this small family-owned newspaper group with an outsized heart has consistently been at the forefront of issues confronting our communities. Looking back, it occurs to me that we’ve been incredibly fortunate to have so many truly talented and compassionate writers come through our doors at one time or another. We provided internships to aspiring journalists in high school and college, and the first paid journalism gigs for writers like acclaimed author Luis J. Rodríguez, Los Angeles’ inaugural Poet Laureate appointed by Mayor Eric Garcetti. Our nonprofit foundation has provided food, toys and literacy training to thousands of east, southeast and northeast residents. It has been our privilege and honor to serve the residents of historic Eastside communities who have contributed to the cultural, civic, and economic wealth that defines Los Angeles. Throughout our 39-year stewardship of this community trust, we have made it our mission to highlight those contributions and ensure they do not go unnoticed or unacknowledged. We are at once saddened and excited at the prospect of turning this civic institution over to an entrepreneurial leader or a group of leaders capable of appreciating and running with the opportunities EGP ownership represents. The Eastside has changed and evolved significantly since 1979, and while those many changes are indicative of just how far we’ve come as a community, recent headlines, uncanny mirrors of headlines we published decades ago, suggest we should remain vigilant. The similarity of stories that appeared within our pages at the beginning of our tenure is a vivid reminder of the still urgent need for the kind of grass-roots community journalism we ushered in as pioneering newspaper publishers. It’s not all gloom and doom, however, far from it. These communities are rich in possibility and opportunity, but the voices from within these neighborhoods must be included as changes are made so they too can share in the prosperity. It is our utmost hope that a new family of torch-bearers will find it within themselves to step up and assume a stewardship which demands a great deal of sacrifice but offers untold rewards in exchange, material and otherwise. We plan to take our leave and step away soon from the relentless production schedule into which we have poured the better part of our lives, and are now accepting proposals from prospective buyers who understand the implications of advocacy and humanism in the context of media and mass communications and who consciously celebrate unchecked imagination. If interested, email me at publisher@egpnews.com. August 10, 2017 Copyright © 2012 Eastern Group Publications, Inc.
Saludos to the EGP family. What an amazing close to 40 years. Well I did not begin my writing at egp, I did write for you during the most crucial time of my life. Of course you know that that’s when I was on trial Etc. (which I won). Writing columns for you and then later writing articles for EGP was memorable. The most memorable part was the relationships within be organization. Always respectful. Anyway I wish I was the one stepping forward to say sure I can buy it. I’m a professor nowadays in Arizona with a profesor’s salary. I don’t think that’s quite enough to buy EGP. But my heart will always be with EGP and in East LA always. As you probably know have stayed in the world of Journalism, primarily call him writing throughout pretty much my whole life. But here’s an FYI that I don’t know if I ever told you; I began my association with publishing as a paperboy for the East LA Tribune. That’s close enough. Have a great future… Whoever gets that torch I know will take it to a good place. I am a photography teacher in southgate and would love for my students to share their stories with you. Do you have internships in photography, editing publishing? The kids and their lives are the exact stories this newspaper should be telling to shape the future of the southeast. Please contact me to start building opportunities for local talented photographers and story tellers! Thank you for your inquiry. Email EGP Managing Editor Gloria Alvarez at editorial@egpnews.com with your contact information and any questions you may have.